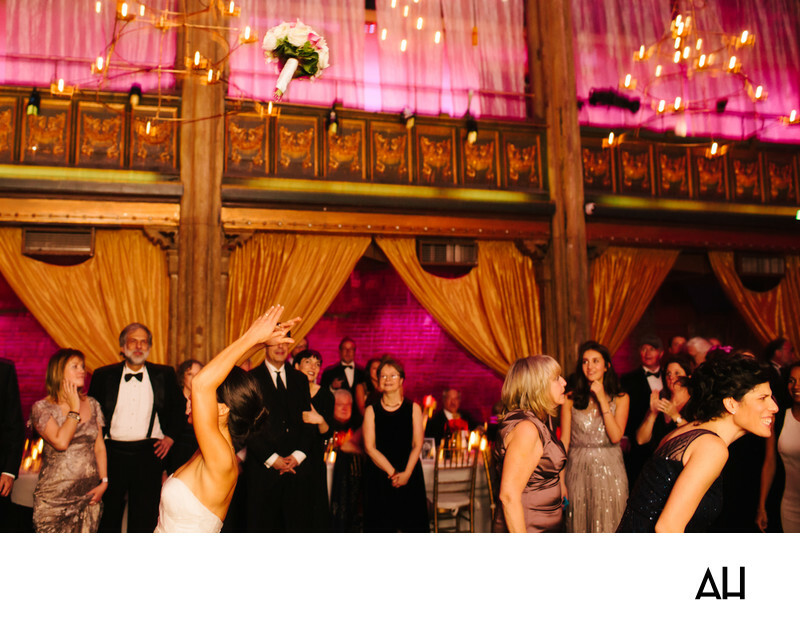 An Angel Orensanz Foundation Wedding is held at a location that celebrates culture and the arts in the Lower East Side of Manhattan. The Angel Orensanz Foundation was established in 1992 by a group of artists and scholars. The group was inspired by the work of the Spanish artist, Angel Orensanz, and by the unique architecture of his space, now home to the foundation. The center has become a beacon for the visual and performing arts in New York City, and for artists from all over. An Angel Orensanz Foundation Wedding is noted for the lavish decorations that can be seen throughout the venue. This picture shows the details of those decorations. To the sides of the dance floor, bold pink lighting shines behind gold hued curtains. Wire chandeliers hang from high, vaulted ceilings, with small lights that twinkle like tiny fairies flying above the celebration. In the midst of the color and splendor of the room is the bride, lovely in white. The image captures an action shot of the bride as she releases her bouquet from her hands into the air. The funny thing about this photo is that not many guests seem to notice that she has done this, which is a testament to how much the guests were enjoying themselves. The wedding was a black tie affair, with all the men wearing tuxedos or formal black suits. All of the women pictured at the celebration are wearing long dresses in neutral colors of beige, brown, or black. These mild tones make the brilliance of the ballroom all the more vibrant. It was a day of colorful energy and dazzling love.